This cute pink, white, purple and green Minnie Mouse Jumper is sure to woo the Minnie Mouse fans at your next gathering! 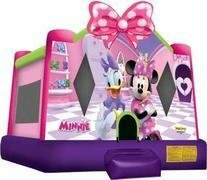 Minnie and Daisy are front and center beneath Minnie's signature pink polka dot bow to welcome a fun and safe jumping experience to your guests. 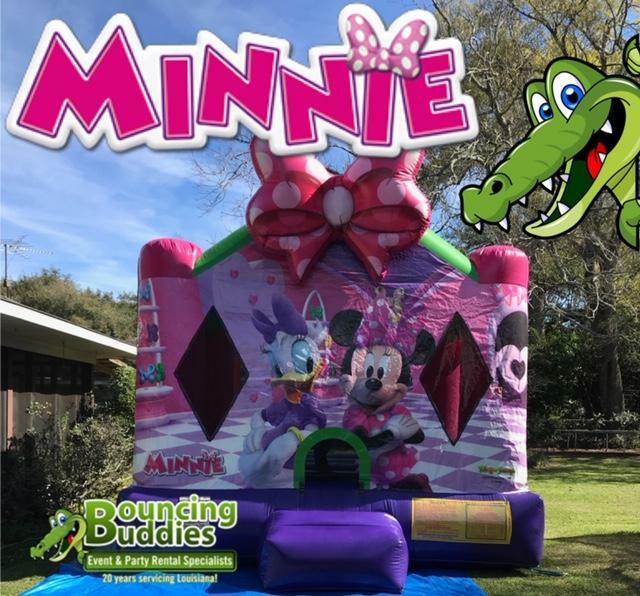 Our Minnie Mouse Jumper features large mesh windows for cooling, safety, and maintaining a visual on your happy bouncers inside, as well as a safety step for easy entry and exit, and just under 245 square feet of jumping area!! Got Bounce? The Bouncing Buddies Minnie Mouse Jumper is great for family entertainment, providing the most popular form of amusement for children. Bouncing also puts you in a state of health and fitness, improves your sense of balance, creates an aerobic effect for your heart, strengthens your muscles, and increases the capacity for respiration, resulting in better mental performance!